Annans William Hill cup dream came to an abrupt end at the hands of Greenock Morton on Saturday afternoon after the visitors ran out comfortable four one winners. It was a disappointing end to Annan’s cup hopes after their previous impressive fourth round victory over Hamilton Academical. The expectations on Annan were high but on the day Morton did a very professional job in controlling the game apart from a spell at in the second half where Annan threatened to get back into the game. Annan boss Jim Chapman started with the team which defeated Elgin City the previous week apart from the inclusion of on loan Celtic lad Jack Breslin who was included in the starting line up in place of Ryan Finnie who had departed to Alloa Athletic. Morton made their intentions clear from the opening kick off forcing Annan to defend deep in their own half. The visitors looked particularly dangerous down the right flank through Bobby Barr who looked a constant threat. The visitors pressed forward almost from the opening whistle Jordan Hart pulled off a fine save pushing Johnstone’s excellent 10th minute shot past the post and from the resulting corner Flynn headed off the goal line. Morton continued to prod for the opening with Annan having to work exceptionally hard to contain the positive Morton team who were unfortunate once again in the 15th minute when Ryan McStay headed O’Ware’s net bound header off the goal line. Morton open the scoring in the 21st minute when Stephan McCluskey finished a clinical move down the right after Denny Johnstone set up McCluskey who’s stunning shot flew past Jordan Hart. 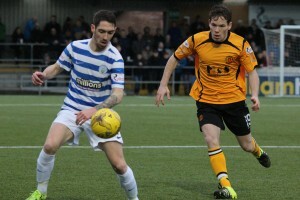 It was just reward for Morton who’s pacey attacking football had Annan in trouble . Declan McManus had a great opportunity to double Morton’s lead on the half hour mark when the goal opened up after Annan had been carved open but McManus failed to hit the target and the opportunity was lost. Just when it looked like Annan would hold out till half time Morton struck again in time added on when Johnstone a constant threat all afternoon slipped a pass to Joe McKee who’s wonderful strike ripped into the top corner of the net to give the visitors a two goal cushion. Annan boss Jim Chapman made 2 early substitutions in the 53rd minute bringing on strikers Smart Osadolor and Lewis Guy with Todd dropping back into the midfield roll and the changes had a positive impact with Annan for the first time in the game taking the game to Morton. Osadolor was unlucky in the 60th minute when his rasping shot from the edge of the box swerved past the upright. Just when it looked like Annan were getting a foothold back into the match Morton struck again although Annan will no doubt look back on the moment with some regret as they lost possession with Bobby Barr setting up Stephan McCluskey who had the simple task of shooting onto the empty net from 8 yards. Annan’s miserable afternoon was completed two minutes later when Stephan McLuskey completed his hat trick after finishing with an angled shot from inside the box to kill off any hopes Annan had of grabbing a foot hold back in the game. Annan had the final say when Matty Flynn connected with an inviting Smart Osadolor cross to guide his header into the roof of the net past Derek Gaston. Morton can now look forward to the Quarter Final draw while Annan must now concentrate on getting their league campaign back on track. Annan boss Jim Chapman has bolstered his squad with a view to making a positive challenge to gain promotion and for their hopes to materialise they must tighten up in defence where they have the second worse defensive record of the top 7 clubs all chasing the same goal. This seasons Cup run has been a wonderful experience for all connected with Annan and provided many memorable moments but now Annan must deliver in the league. ANNAN ATHLETIC – Jordan Hart, Steven Sloan , Bryan Gilfillan, Martin Mcniff, Peter Watson, Ryan McStay ( Smart Osadolor 53 min), Jack Breslin(Ben Jago 37 min), Matty Flynn, Rabin Omar, Josh Todd, Jordan Morton. Subs not used Blair Currie, Stuart McColm, Greig Macdonald, Scott Norman.